Nuala’s Bar & Restaurant is a delightful family run pub full of genuine Irish charm and history with a great pint and lots of craic. It is located in the village of Tuamgraney, County Clare close to Lough Derg. Nuala’s Bar & Restaurant is a lovely local place to have a drink, eat some great home cooked dishes and relax. It has a charming recently refurbished interior and a very historic atmosphere. Private parties can be catered for and there’s entertainment at the weekend as well a traditional Irish music. With a great menu on offer that includes breakfast which is served from Monday to Saturday from 10am until 12.30pm, lunch is then served until 4.30pm and then the a la carte menu is available until 9pm. The menu boasts fresh and local produce and has a great range of dishes to suit all tastes and it recently received a Georgina Campbell ‘Taste of the Waterways’ aware in conjunction with Waterways Ireland. 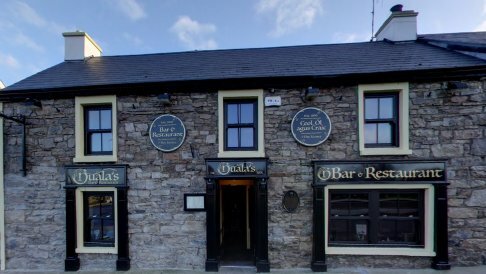 This family business, now known as Nuala’s Bar & Restaurant was originally established in 1850, as Mc Cormacs. It was first run by Patsy Mc Cormac who later handed it down to his only daughter Bridget. Known locally as Baba, Bridget later married John Durack after which the pub became known as Duracks. Baba ran the pub until 1997 when she retired. It is now run by Nuala and Paul Kilkenny. It has only had three different licensees in one hundred and sixty five years, a rare occurrence in pubs in Ireland. Call into Nuala’s on your next visit to Tuamgraney while you explore the Lough Derg Lakelands. Don’t miss the opportunity to visit Holy Island/Inis Cealtra which is only a short distance away with Ger Madden from Mountshannon or hop on board the Spirit of Killaloe that can bring you out on Lough Derg for a leisurely tour on the water.